As a 10-year-old boy in Iowa City, Iowa, Ted Pacha’s first job was selling soda at University of Iowa football games. He didn’t sit in the stands for his first Iowa football game until a few years later. It was a life-changing moment. “My passion for Iowa athletics started as a child, and it has never left,” says Pacha. Today, Pacha and his wife, Deb (1977 R.A.D.T. ), are taking their support to new heights. The Pachas have committed a leadership gift to the Kinnick Edge Campaign, a $25 million fundraising effort to help with renovations to Kinnick Stadium’s north end zone. Last revitalized in 1983, Kinnick Stadium’s north end zone will feature improved concessions, more restrooms, a view of the field from the concourse, an additional 1,600 premium seats, and a club room. The $89 million project is expected to be completed prior to the 2019 football season. Private support is vital to the success of the UI Department of Intercollegiate Athletics—including facilities like Kinnick Stadium—because the department is self-supporting and receives no state funding. 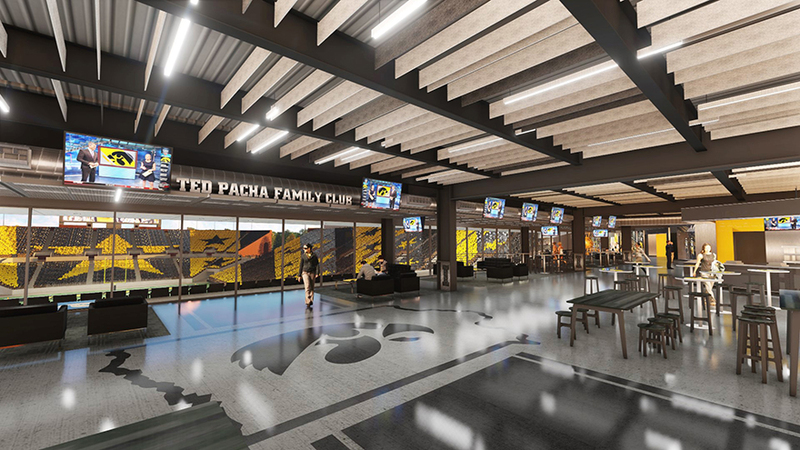 The Pachas have a long history of supporting Hawkeye athletics, and in recognition of their lifetime of generosity and their $5 million leadership gift for the Kinnick Edge Campaign, the Ted Pacha Family Club will be named in their honor. The Pachas’ gift was announced on January 1, 2017, as part of the Outback Bowl festivities in Tampa, Florida. A charter member of the I-Club’s Kinnick Society, Ted Pacha made his first annual gift to Hawkeye athletics in 1974, and he hasn’t stopped since—giving generously for more than 40 consecutive years. The Pachas have supported many capital projects over the years, including the P. Sue Beckwith, M.D., Boathouse; the Roy G. Karro Athletics Hall of Fame and Museum; and past renovations to Kinnick Stadium and Carver-Hawkeye Arena. Pacha has been a long-time volunteer for Hawkeye athletics—serving as president of the National I-Club, the Iowa Women’s Athletics Development Board, and the Johnson County I-Club. He was also named a UI Varsity Club honorary letter winner and is a National I-Club Hawk of the Year honoree. He is the only person to serve in/be awarded all five of these honors. After training as a medic and serving in the U.S. Army from 1968 to 1974, Pacha started Hawkeye Medical Supply, which grew into one of the region’s largest and most successful health-care distribution companies. Pacha spent 25 years as president and owner of Hawkeye Medical Supply, and he is currently the president of Theo Resources, a consulting firm. The Pachas are season-ticket holders for Hawkeye football, men’s and women’s basketball, and wrestling. They have two sons —Kelsey, who will graduate in May from Pacific School of Religion in Berkeley, California, with a master of divinity and master of psychology and religion, and Alex, a fourth-year University of Iowa student. To learn more about the Kinnick Edge Campaign, visit KinnickEdge.org. The UI Foundation is the preferred channel for private contributions that benefit all areas of the UI, and its mission is to promote the UI’s commitment to excellence through engagement and philanthropy. The university’s dedicated contributors fund a broad array of needs, from student scholarships, breakthrough research and life-changing health care to innovative facilities, community outreach and global education. Contact: Dana Larson, executive director, communications and marketing, University of Iowa Foundation, dana.larson@foriowa.org, (319) 467-3661, (917) 345-9841 (mobile).